You are here: Home / NICC Blog / Fishing / Fishin' Derby / It’s Derby Time Again! N.I.C.C. 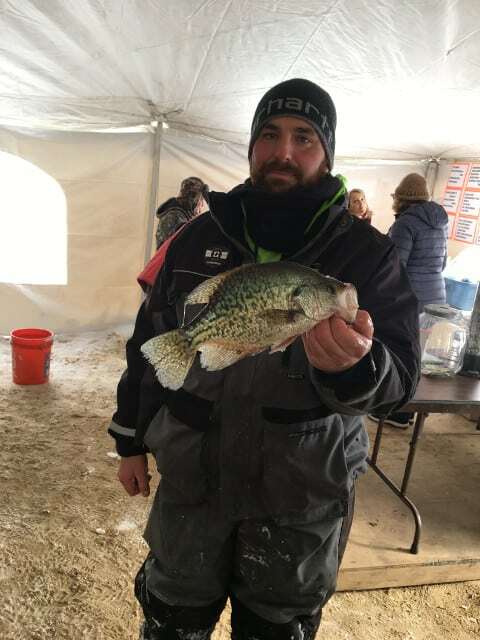 is in full swing preparing for our main fundraiser of the year, our 59th Annual Ice Fishing Derby and Winter Festival to be held on February 9th & 10th 2019. Headquarters will be at Turtle Beach located at 42273 N. Woodbine Ave. Antioch, IL. Our 59th Derby could not possibly happen if it weren’t for many of our N.I.C.C. members who volunteer their time and energy to make this a successful fundraiser. Preparations for ticket sponsors egin well before Halloween, when members contact businesses who are truly generous enough to underwrite the cost of running the derby. Then it’s time to solicit local businesses to place an ad in our information booklet or donate an item for our auction. Committees are formed for auctions, fish judging, raffles, ticket and food sales. When auction items are collected, they go to the chairperson in charge who places them in the right category. If you have never joined us, please do so. Bring your family and friends to enjoy the carnival atmosphere. There will be hourly raffles, games for the children and adults on both days. Come watch the fishermen register their catch of the hour inside the t ent hoping to win a prize for the smallest or the largest fish. Remember, the children’s auction is held on Sunday, February 10th at about 3:00 pm with the adult auction next followed by the main raffle. You will be receiving raffle tickets in the next couple weeks. Tickets are selling for $3 each or 2 for $5. Proceeds from this fundraiser helps defray our yearly expenses and also allows us to provide a scholarship to either an Antioch Community High School student or a Lakes Community High School student. Raffle ticket sales are the most important parts of the derby and is how we are able to give back to the community. TICKETS: We have cash prizes to be raffled off this year, $1,000, $500 and $250. DERBY BOOKLET: The advertising book has become successful for the media portion of our derby. Earlier, members were sent copies of our Sponsorship Opportunities form either through the mail or email. We have already received some ads from members. AUCTION ITEMS: We are always looking for auction items for the children’s and adult auction. VOLUNTEERS NEEDED: Runners during the auction, adult games, ticket sales, help at the bucket raffle table. Please contact us if you would like to volunteer. Can Participate in 2019’s Derby!